The Angular Spectrum Evaluation Tool (often abbreviated to ASET) was created by the American Gem Society (AGS). 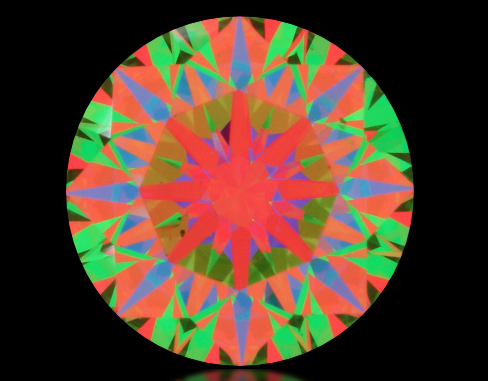 This simple device provides a detailed look at the light handling properties of a diamond. The presence of brilliance, fire and scintillation is essential for a beautiful diamond therefore understanding and interpreting the finer details of cut quality and light performance will result in better choices and a brilliant, sparkling diamond. 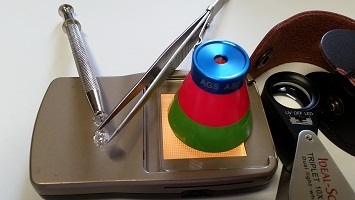 ASET goes beyond the original form of a reflector tool; it is also a theoretical basis for the American Gem Society Laboratories (AGSL) cut grading system based on light performance. The AGSL grading system is one of the most scientifically strict and technologically advanced grading systems in the world of gemmology. Produced in 2005, the reflector device is used in conjunction with a sophisticated, specialist diamond software. 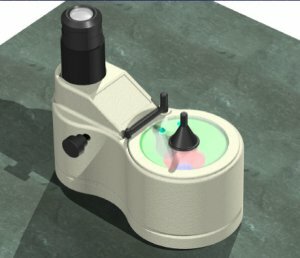 Using ray trace analysis, the ASET details the light performance grading and can also produce a computer generated ASET image, and additional light maps pertaining to the diamond. The concept of ASET is essentially about extracting specific details regarding the light handling properties of a diamond. The diamond is viewed through the top of a hemisphere. The hemisphere is painted with colors, and each of the colors correlate to specific angular ranges. When looking through the ASET tool, the viewer will see the light appear in different colors, depending upon where that light is coming from. When a diamond does not effectively return light, this is known as light leakage, which can also be seen by the viewer through the ASET tool. The light that is returned from the varying ranges on the horizon will have different attributes and effects on the appearance of the diamond. The ASET provides information not only on how the light is being handled in the diamond, but the specifics of each range. The angular ranges are as follows: 0-45 degrees (color coded in green), 45-75 (color coded in red), and 75-90 (color coded in blue). We generally view things lit from above (by sunlight or artificial light) so most of the direct light will enter a diamond from the higher angular ranges. The light that enters from low angles is generally indirect, for example if the light is reflected off other objects surrounding the diamond. This means that the light from lower angles is generally less intense than light entering from a higher angle. 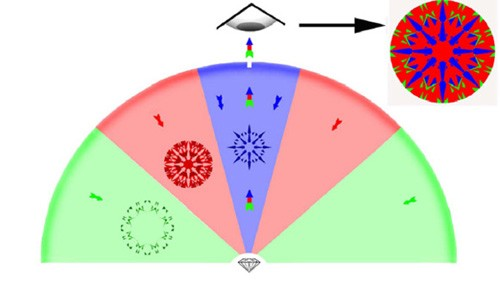 Light from the highest angular range (directly above) is blocked by the viewer when they look at the diamond from close range. This light is signified by the color blue. Although this suggests darkness rather than light, the presence of blue on your ASET image is not necessarily a bad thing. In fact, a balance of darkness and light is essential for giving a diamond one of its most coveted properties – its twinkle. The dark shadow (obscuration) provides contrast against the areas of light and creates the blinking or twinkling affect we see in diamonds, known as scintillation. This ideal-cut diamond from the Whiteflash A CUT ABOVE® range is an example of a good ASET image. A well-cut diamond will present red as the dominant color, a small amount of green, and an even, symmetrical pattern of blue. There is also minimal light leakage show on this image which is desirable in a diamond. This is an example of a diamond which would have light performance issues. The patterning is irregular and chaotic and there are large amounts of green dominating the image. This would translate into a diamond with a diminished sparkle due to its inability to handle light effectively. A huge benefit of the ASET analysis is that it can be applied to any shape of diamond and grading systems can be formed for each of them. The AGSL has already developed these grades for Round, Princess, Oval and Emerald Cut diamonds, as well as some forms of cushion cut diamond shapes. Fancy cuts can be extremely variable and do not have the same strict parameters of a round, for example. When it comes to fancy cuts, an ASET analysis is a great way of gaining a better understanding of how these complex diamond shapes handle the light, and what features are going to be most desirable to a buyer. There are several forms that the ASET tool can take. The biggest difference between the ASET viewers is how light leakage is presented. The backlit versions of the tool will present light leakage as white, while the tools that use a dark background will present the light leakage as black. There are also presentation, desktop and handheld models of the ASET tool. This is the desktop version of the ASET tool. A diamond is placed on the glass, face down with the table flat. A black cover is placed over the diamond which gives a black background. The device is fitted with a series of mirrors, which bounce and project the image into the viewing window and the eye of the viewer. The black background of this model causes light leakage to be shown as black. The image above shows the handheld model. This version is a portable and high functioning tool; although it can take some practice to use, once you have mastered the handheld model it is one of the most convenient and functioning tools around. The diamond can be viewed in an upright position and the backlighting will cause any light leakage to be presented as white. Another advantage of this model is that it can be used with or without a portable light source. Ideal for a diamond aficionado on the go. The basis of the AGS light performance grading system is directly correlated to the ASET process and this is integrated into the specialist software. This process begins with the ray tracing of a precise 3D model of the diamond; the facets of the diamond are measured and the process can also evaluate matters of light leakage, fire, contrast and brightness. This software produces ASET images of the diamond and some AGSL reports will include the ASET light maps. A Platinum AGSL report can be ordered with one or two light maps. These maps show a table and pavilion ASET of the diamond. You will see two light maps usually presented on reports of high precious, high performance diamonds, where hearts and arrows patterning can be easily identified. Other computer programmes such as Octonus’ DiamCalc can also provide ASET images. These images are sometimes used by diamond vendors in lieu of ‘real’ images of the diamond. Although it is always my recommendation to assess high-res images and videos of a diamond, an ASET image can provide huge amounts of information pertaining to the light performance of a diamond. If you understand how to read an ASET image, you can translate this into an accurate understanding of how beautiful the diamond is and its ability to display the desired properties (brilliance, fire, scintillation etc). The entire ASET framework is built upon mathematical precision meaning that the maps are accurate and reliable. It may not be a substitute for high-res imaging, but if it is the only information available on the diamond, you can still build an accurate representation of how the diamond will perform. The Idealscope is a reflector tool that was formed from the findings of a Japanese scientist in the 1970’s. 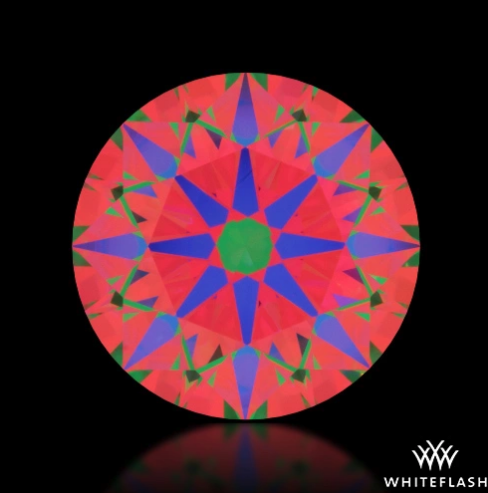 It is a simple tool which can give information about light leakage and basic symmetry. 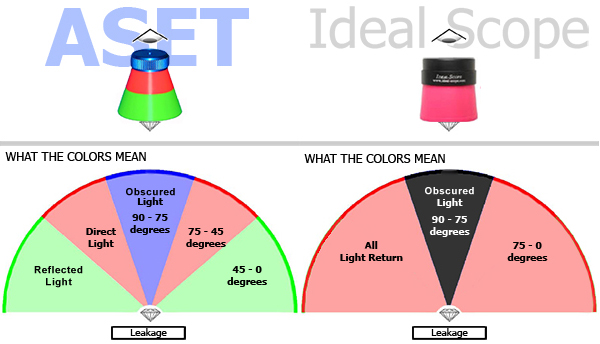 Although the basic principles of the Idealscope and ASET are similar, the ASET provides a much greater level of detail regarding the quality of light return. An Idealscope is a great starting point for analysing light performance due to its user-friendly nature. 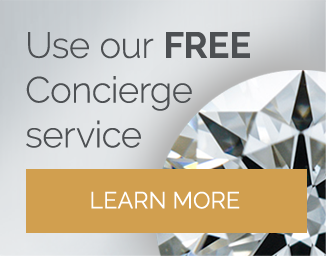 The ASET framework is hugely beneficial to a diamond buyer. It is a precise and accurate way of assessing light performance, allowing the buyer to gain important insight into the appearance of a diamond in a structured, mathematical way. 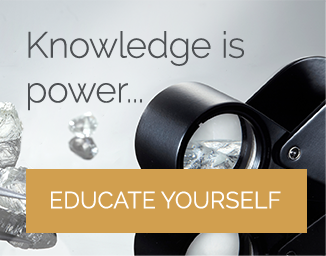 Once you have grasped the basics, you can use this knowledge to make informed decisions about your diamonds, finding the best possible quality and light handling properties possible. 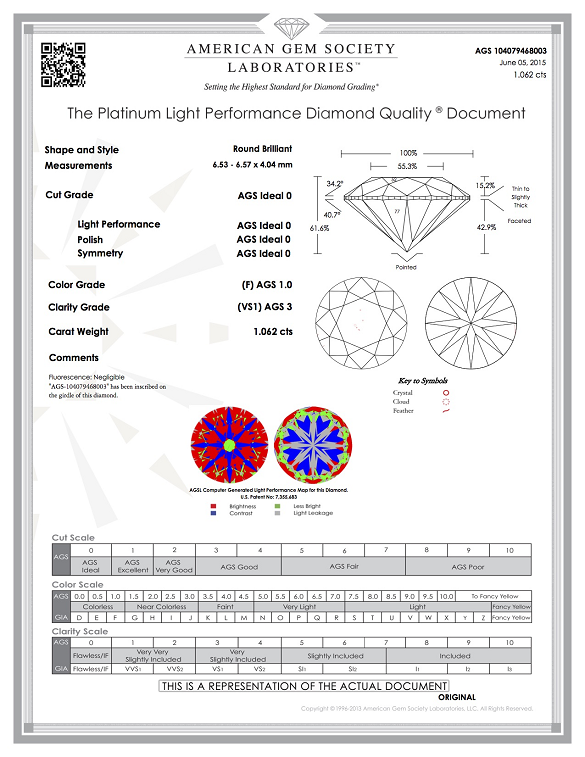 Use these light maps alongside high-res images and other analytic reports to build a complete view of your diamond. 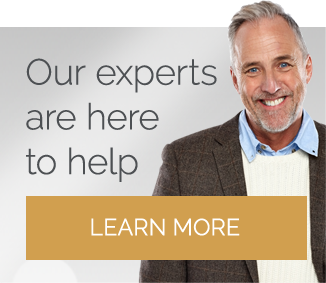 For the best cut diamonds with diamond images and HD videos, consider Whiteflash and A CUT ABOVE® Diamonds. I would also consider James Allen and Blue Nile – they will provide some diamond images on request, and have HD Video.